After striking a well-appreciated chord with audiences everywhere in the highly praised Dr. Horrible’s Sing-Along Blog, the voice of Neil Patrick Harris is in almost as high demand as the actor himself. And last week in a special episode of the animated series Batman: The Brave & The Bold Harris’s voice made an impressive appearance as a new kind of villain for Batman to face: the Music Meister. With powers similar to those of the infamous pied piper, the Music Meister can hypnotically control those around him with his voice. Using this power, he manages to bring the forces (both good and evil) of Gotham against Batman. Featuring Aquaman, Gorilla Grodd, Black Manta, Clock King, Green Arrow, and Black Canary, this episode walks a thin line between straight-out camp and comic book action. With the popularity of the episode assumed, Warner Brothers has also decided to release the songs of the episode on a short soundtrack album. Though only eight tracks long (around 20 minutes of music) it’s a worthwhile album for those interested in the world of Batman, or fans of Neil Patrick Harris – and who says you can’t be both? The album opens with Andy Sturmer’s action-packed and jazzy show theme – which many fans may want to download on its own. Immediately following the familiar theme is the introduction to the character who rules this episode, in the introductory track “I’m the Music Meister.” Neil Patrick Harris expertly introduces his character with lyric by James Tucker and music by Michael McCuistion. It’s a catchy little intro, particularly when the Music Meister and Black Canary (Grey DeLisle) entertain a brief duet. Answering Harris’s “I’m the Music Meister – crime became my path!” with “He’s the Music Meister and we must beware his wrath!” audiences can already hear how well Harris and DeLisle’s voices will work together for the rest of the episode. As the Music Meister falls for Black Canary we get more of these duets, including the classic musical love song “If Only” and the action-y track “Death Trap.” These two serve each other well, which also helps to sell the episode. Though this album is clearly marketed to a very specific target audience (Batman: The Brave & The Bold fans and Harris die-hards) the music is good enough to draw in others who might stumble upon it. With straight-sung lines like “If only she could love me like I love villainy!”Â it’s hard not to crack a smile while listening to this album, but the producers of this episode have made enough of an effort to instill this musical episode with enough familiar Batman themes to get the most anti-musical Batman fans on board. 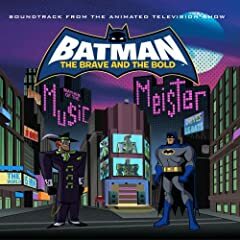 No user commented in " Music Review: Batman: The Brave & The Bold: Mayhem of the Music Meister! Soundtrack "